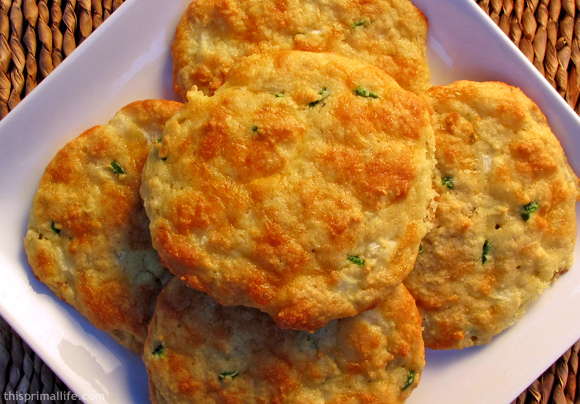 Primal Cheddar Jalepeno Biscuit Rounds: very cheesy, a little spicy, and not too eggy. It may be cooling off a little but barbeque season isnt quite over yet. I recently made a huge rack of ribs with a tangy rum-mango sauce (Ill post the recipe later this week that would have been just fine with some grilled vegetables. But having recently purchased Everyday Grain-Free Gourmet: Breakfast Lunch and Dinner by Jodi Bager and Jenny Lass, I decided to try my hand at some primal biscuits as an accompaniment (in addition to the vegetables, of course. The book has recipes for plain and cheddar cheese biscuits as well as a berry morning popovers recipe (which I have also made and loved that relies on the same base ingredients. I still have a way to go before Ive fully explored the diverse range of recipes in this book but so far I highly recommend this and their first book, Grain Free Gourmet for some great ideas on easy-to-prepare, grainfree, refined-sugar-free and lactose-free recipes. Although written for the Specific Carbohydrate Diet, primals will find plenty of useful recipes in both books, especially if you include some dairy in your diet like I do. Other recipes in these books that I cant wait to try are: Crepes with Brie and Caramelized Apple, Cannelloni, Souffl Bread, Gourmet Pizza, Tiramisu, and Apple Galette. Here is my twist on the Cheddar Biscuits. I made a half batch because it was just the two of us and I figured I could do without a lot of extra biscuits around the house, primal or not. Youll have to figure out how to halve 3 eggs on your own, though, because what I did wasnt pretty. If you make a full batch I would recommend using two baking sheets because these spread out considerably as they cook. Combine almond flour, baking soda, and salt in a large bowl. Mix in grated cheese and jalepeno. In a separate bowl, mix the eggs, yogurt, and water. Combine the wet ingredients with the dry ingredients. Drop batter in large spoonfulls onto a greased baking sheet or parchment. Bake at 325 degrees for 20-25 minutes until slightly browned on top. OMG these look absolutely amazing! i have to give these a try. Thanks for the cookbook recommendations… we were searching for a good grainfree cookbook to add to my wife’s collection… I think you helped us narrow it down! This book has a TON of information and many, many thoughtful recipes written specifically for people modeling their diets after hunter-gatherers. I also like the book Nourishing Traditions (available on Amazon) by Fallon. Includes some grains but still very useful. Wow, these look so great. Now all I need is a pot of beans and I’m happy as a clam. Shelley, these look awesome. My mother and I have been trying some of the recipies from Mark’s video challenge. We have been dissapointed in most…except for yours! You really have been a blessing. I keep telling my mom, “If Shelley can get her two girls to eat it, then it must be yummy!” We made the Coconut Orange Pound Cake today (wonderful) and will try these biscuits on Friday. Thank you for doing this. We love your ideas. o-m-g .. looks awesome and I have just ordered the BOOK !! Update: just made these to accompany a vegetarian chili, and YUM! So flavorful and they have a nice tender bite. Kimberly – So glad you enjoyed the pound cake. I am sure you will like these. The kids are the ultimate test! I didn’t give them these because the jalepenos were a little spicy and they aren’t really into spicy, but they loved the berry popovers from the same cookbook. So much better than your standard store-bought blueberry scone or muffin! Thanks, Ginger. I’ll pass that on to my husband, the resident photographer. Liz – you won’t regret it! Alta – Although I made these to go with ribs, I was thinking they’d be awesome with chili. What a great site! This is my first time to browse around. We are on the Specific Carbohydrate Diet in our home and I’m glad to see so many recipes here to try! Yumm! Holy whoa those look amazing! Gotta remember to try them when we get settled in CA. I made these yesterday for a friends BBQ (other than my husband & I…NO ONE is primal!) Everyone went NUTS over these!!! I especially loved them because they reminded me of cornbread, which I have been missing over my beanless chili, I know how a substitute!! Just a tip, I did dip my 3rd one in some homemade chimichurri & that was an amazing duo! Thank you for the recipe!! So glad you like them, Jen! I love chimichurri sauce. I made these tonight…YUM! My first jalapeno of the season was still kinda small, but I harvested it and included it (seeds and all) into the “dough” after scooping out some for the kids. The jalapeno gives the “adult” ones a nice flavor and the sharp cheddar alone was a hit with the kids!